700 sharks live in the south pass of Fakarava, a preserved atoll of French Polynesia. This pack represents the highest density of gray reef sharks known to date. In this horde of animals fighting to survive, the energy of the hungry is king. As soon as a prey is flushed out, a pack forms and the chaos turns to order. The sharks perform crazy choreographies which end in a rain of fish scales. Slaves of their instinct, thousands of groupers join the perilous ballet to reproduce here, once a year, as sacrificed volunteers. That such a slice of wild nature still exists, is simultaneously reassuring, frightening and dazzling. After 4 years of expeditions, this miracle from the animal world finally emerges from the dark. 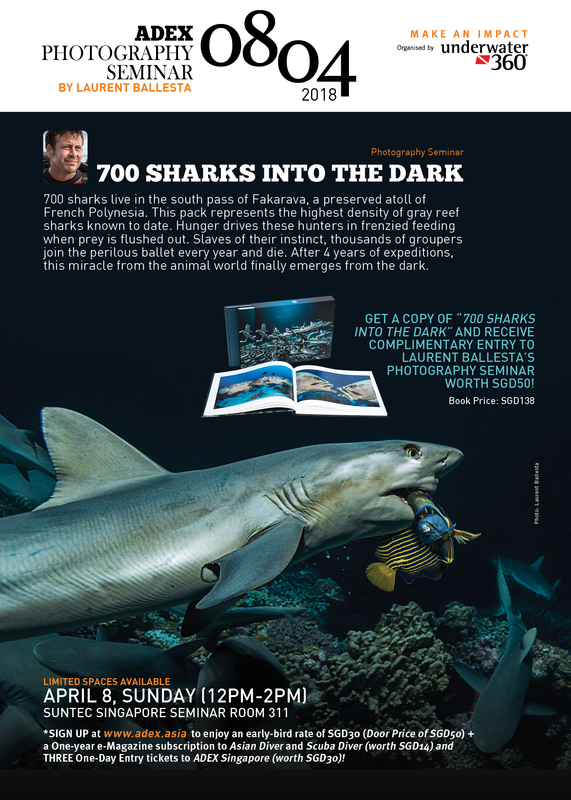 Purchase a copy of “700 Sharks Into The Dark” and receive complimentary entry to Laurent Ballesta’s Photography Seminar worth SGD50! Laurent studied marine biology, which culminated in a Master’s degree. He discovered a species of fish hitherto unknown in the Western Mediterranean. Combining his passion for underwater photography with his work as a biologist, Laurent has won numerous awards, and has been featured in international publications. 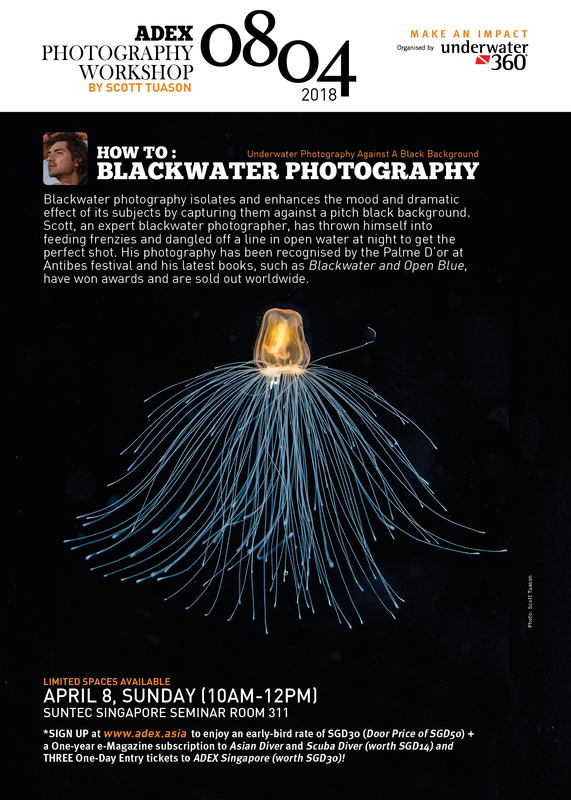 Blackwater photography isolates and enhances the mood and dramatic effect of its subjects by capturing them against a pitch black background. Scott, an expert blackwater photographer, has thrown himself into feeding frenzies and dangled off a line in open water at night to get the perfect shot. His photography has been recognised by the Palme D’or at Antibes festival and his latest books, such as Blackwater and Open Blue, have won awards and are sold out worldwide. Scott was first handed his underwater camera at the age of 16. Decades later, his passion for photography has brought him on amazing journeys. From throwing himself into a feeding frenzy to dangling off a line in open water at night, his photography has been recognised by the Palme D’or at Antibes festival for his book Anilao, which he co-authored in 2000. His latest books, Blackwater and Open Blue, have won awards and are sold out worldwide.